I’m not sure I’d want to attempt cooking without modern conveniences like a food processor and bottles of oil and jars of spices at hand, but it’s so interesting to learn about the techniques and ingredients used by Native Americans in the days before Columbus arrived. I received a review copy of Spirit of the Harvest , a James Beard and IACP award-winning book, and it describes the foods of Native American Indians from each part of what is now the US. The book is organized by region with recipes and information from the tribes that lived in each area. Traditional approaches to the dishes are explained, but the recipes themselves have been adapted to more contemporary practices. You won’t need to procure bear fat which was used for cooking some of these dishes in the traditional manner since these days vegetable oil, or if you prefer bacon fat, can be used instead. Primary ingredients are kept the same for the most part though. I didn’t realize Jerusalem artichokes are native to this land, and the Cherokee used them in various relishes, pickles, and preserves. There’s a recipe for spiced Jerusalem artichokes with cider vinegar, mustard seeds, dill seeds, and fresh dill. Jerusalem artichokes show up again in a dish from Plains tribes that’s adapted from a technique of burying tubers in hot coals to cook them. Here, broiling is suggested instead. From the Northeast, there’s a hearty fish soup with mushrooms and lima beans from the Iroquois and maple popcorn balls from the Algonquians, there are huckleberry and cranberry fritters from the Northwest, and from the Southeast, there’s a carrot bread made with cornmeal, honey, and dried blueberries. There are also recipes for game like roasted buffalo and buffalo jerky, stewed grouse, sugar pumpkin stuffed with venison, ducks stuffed with wild rice and mushrooms, and Pueblo rabbit. It’s interesting to see the various types of breads including ones that are baked, others that are fried, and some that are grilled or cooked on a griddle. Cast-iron pans had been obtained by Native Americans through trade, and young women who attended non-native schools in the late nineteenth century learned about cooking with yeast and flour. Also, by that time, many Indian homes included wood-burning stoves and ovens. The first bread I wanted to try was Navajo fry bread. In the Southwest chapter, there’s a dish of prickly pear cactus and eggs which is to be served with tortillas or bread and a relish or salsa. I made a vegetarian version of it and served it on top of fry bread garnished with the Sacaton relish. 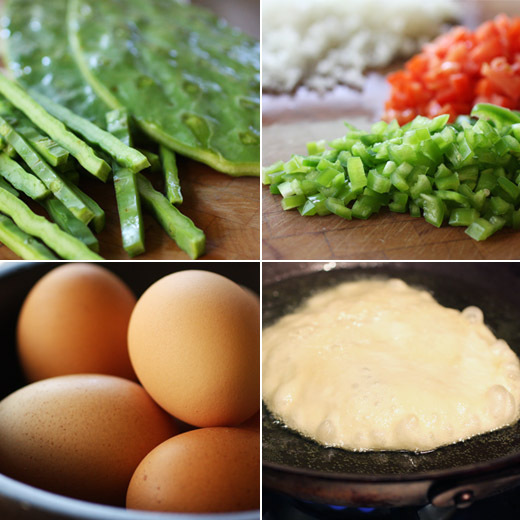 The cactus and eggs element is essentially a hash. Rather than making it with bacon, I made a hash of potatoes and mushrooms and added the other ingredients from the recipe which included cooked, chopped prickly pear cactus pads, minced onion, and ground New Mexican red chile powder. The cactus pads, or nopales, are easy to find fresh here in Austin. I chopped them into strips, boiled and drained them, and then added them to the hash. If not available fresh, they are also sold already cooked in cans. If you've never tasted nopales, they taste like a very slightly tangy green bean. The Sacaton relish was a quickly-cooked salsa with mild green chiles, chopped jalapeno, minced onion, and diced fresh tomatoes. To make the fry bread, the dough was stirred together and left to rest for 30 minutes. Then, a small handful at a time was patted into a round about one-eighth of an inch thick and fried in vegetable oil. I spooned the hash on top of each piece of fry bread, topped that with a fried egg, and garnished with the tomato and chile relish. 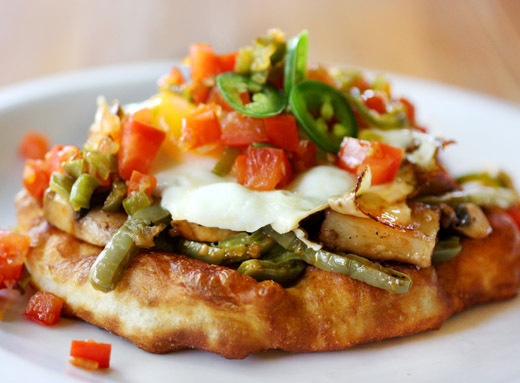 I have to tell you that tasting this fry bread inspired one of those little dances I do around the kitchen when I get really excited about food. Puffy, crispy, chewy, and delicious is what it was. Be sure to let it cool a bit before attempting to taste it. Don’t ask why I suggest that. 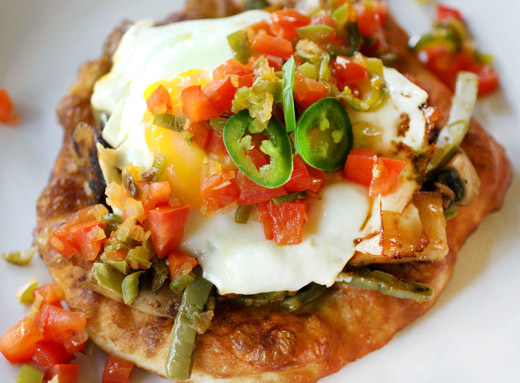 The hash with fried egg and relish was perfect on the fry bread, but of course you could go the route of Indian tacos and top the breads with your favorite taco fillings. Or, you might choose to make the breads into sweet treats with honey or powdered sugar. However you wish to serve them, they’re very worth trying. Re-printed with publisher’s permission, Stewart Tabori & Chang. In a mixing bowl, combine all ingredients except oil and knead until smooth. Rub oil over dough. Cover and let sit for about 30 minutes. Either pat or roll out enough dough to fit in the palm of your hand in a circle about 1/8th inch thick, and deep-fry in hot oil. Usually Fry Bread is a little larger than the size of your hand. Makes 10 to 12 Fry Breads. Note: I cut the recipe in half, and it worked very well. I also pan-fried, rather than deep-frying, the bread with hot oil in a saute pan for about two minutes per side. I don't usually show you the same thing twice, but these caramel bars are worth mentioning again. 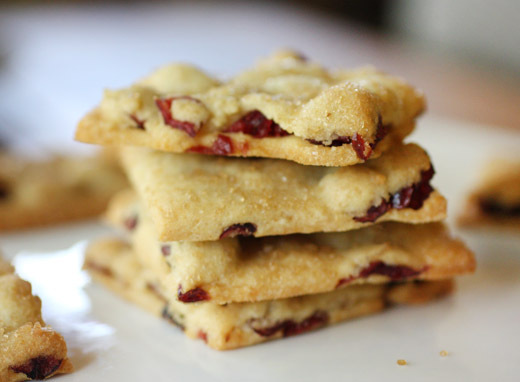 The first time they appeared, they were one of three cookies in a post and didn't get enough of the spotlight. I made them again recently for a bake sale, and now I'm giving them the attention they deserve. They're from The Modern Baker by Nick Malgieri, and he notes that if he had to choose a favorite cookie this would be it. That's a serious statement coming from someone who has baked as much as he has. I don't know that I could pick one favorite cookie. Maybe I could narrow down a few favorites I've baked this year or possibly an all-time top ten list. Can you name one favorite cookie? I did make one change to the bars this time. Rather than baking them in a nine by thirteen-inch pan, I used a nine-inch square pan. I wanted each layer to be a little thicker than they were last time. I left them in the oven for a few extra minutes, and the change in pan size seemed to work fine. The dough is as easy as it gets. 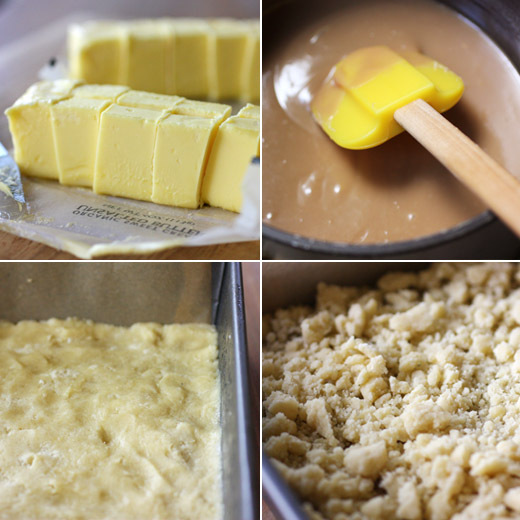 Butter, sugar, salt, vanilla, and flour were combined in a mixer, and then three quarters of the dough was patted into a pan that had been lined with parchment. The remaining dough was reserved for the crumb topping, additional flour was added to it, and it was worked into about one quarter inch crumbs. The pan with the dough was chilled. Meanwhile, the caramel filling was made in a saucepan from a mixture of butter, corn syrup, brown sugar, and condensed milk. It thickened and turned a nice, caramel color in about ten minutes. It was allowed to cool for five minutes before being poured onto the chilled dough. The crumb topping was sprinkled on top, and the bars baked for 35 minutes in a nine-inch square pan. Since I baked mine in a smaller pan for a few minutes longer, the edges became just slightly darker than I wanted. After the bars cooled and I removed them from the pan, I trimmed a thin slice off each edge. It was an added step to the process, but I really liked the thicker layers in this version. 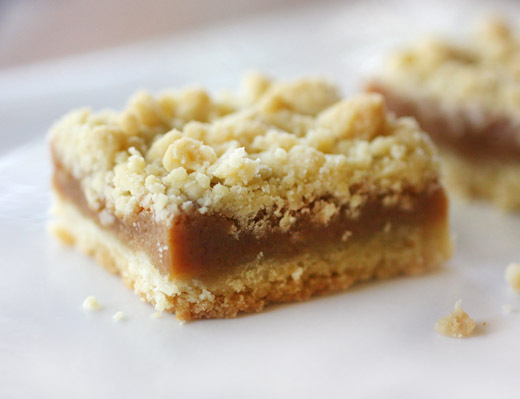 The cookie base was crunchy, the caramel filling was gooey but held its shape well, and the crumb topping was buttery bliss. 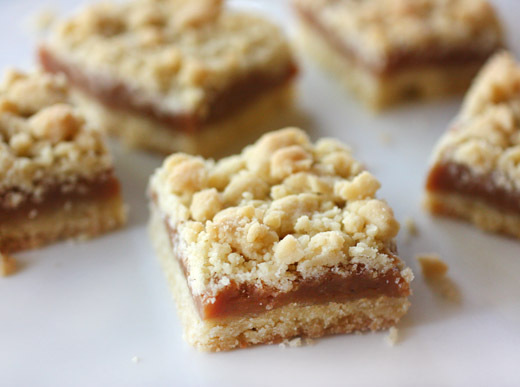 I'm easy to please when a cookie includes caramel or a crumb topping, and these have both. I might not mention these on this site for a third time, twice seems like enough, but I'll definitely be making them again and again. The new book from Louis Lambert, Big Ranch, Big City Cookbook: Recipes from Lambert's Texas Kitchens , begins with a discussion of chefs’ culinary styles. For Lambert, what he most loves to cook has everything to do with his upbringing in the West Texas town of Odessa and the kinds of food his family always brought to the table. Lambert graduated from The Culinary Institute of America and then worked in New York, Dallas, and San Francisco. It was in San Francisco at Wolfgang Puck’s Postrio where he had a revelation about cooking. He began to see that many of the dishes he prepared in this urban, refined restaurant were very similar to what he grew up eating on a Texas ranch. He knew he could recreate his favorite foods from home with a few new techniques to dress them up for restaurant dining. And, that’s exactly what he’s done at his restaurants in Austin and Fort Worth. I received a review copy of this new book, and I have great news for two commenters on this post. Two lucky people who comment on this post by Friday, October 28th 2011 at noon CST and who can provide a US mailing address, will be chosen to each receive one copy of the book. Just leave a comment, including your email address so I can contact you, and I’ll randomly pick two winners on Friday. I have to mention what Robb Walsh wrote in the Forward of this book. His first introduction to Louis Lambert and his cooking was by way of an article in Martha Stewart Living in 1996. The article was about West Texas food and Marfa. I remember that article too, and I remember the recipes. I still have them in my files. The dishes in this new book are just as memorable. This is Texas food with some influences from Mexico here and ideas inherited from Louisiana there, and everything has been given some kind of fresh, new twist. The red grapefruit and avocado salad is reminiscent of Lambert’s grandmother’s salad from years ago, but here, it’s been updated with watercress, pine nuts, and goat cheese. The fried green tomatoes are topped with a crab salad made with a Creole remoulade. There’s a posole recipe, but this version is made with shrimp and green chiles, and wild Texas ducks are used for duck rillettes. Of course, there’s a meat chapter including adobo-grilled t-bone with red chile and cheese enchiladas, bock-braised beef short ribs, and crispy wild boar ribs with fresh plum barbecue sauce. But, it’s not a red meat-heavy kind of book. There’s also a Poultry chapter, a Seafood chapter, Tex-Mex, Vegetables and Sides, Breads, and Desserts. I appreciated how every once in a while a recipe caught me by surprise, and that was the case with the gingered acorn squash soup. With ginger in the title of the recipe, I knew there would be a nice spice flavor in the soup. Then, I read about the pineapple in it which adds just a hint of fruitiness. 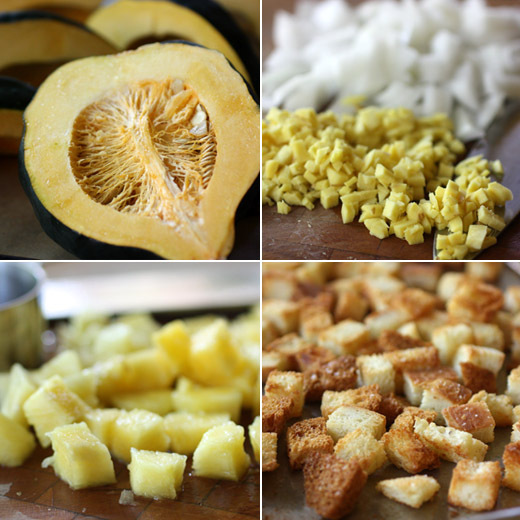 The roasted acorn squash, sauteed onions, and homemade stock give the soup a rich savoriness, and then the ginger and pineapple add little punches of different flavors. Sometimes, when making a soup, the garnishes can seem like a step or two too many but not here. 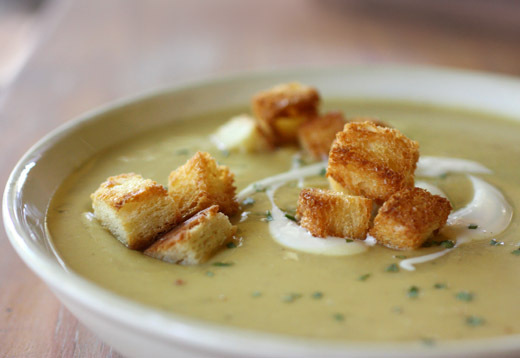 The sour cream with honey, buttery brioche croutons, and a sprinkling of an anise-flavored herb like tarragon or Mexican mint marigold were so well-suited to this soup I urge you not to skip them. This was a hearty, fall soup, and in small portions would be a lovely way to start a Thanksgiving feast. In fact, the entire Thanksgiving meal could come from this book by using the Mexican chocolate chile rub on turkey instead of chicken, whipping up a big bowl of the loaded garlic mashed potatoes, baking the ricotta spinach gratin, and for dessert, I’d pick the gingered pear fried pies. Reprinted with permission from Big Ranch, Big City Cookbook: Recipes from Lambert's Texas Kitchens by Louis Lambert and June Naylor, copyright 2011. Published by Ten Speed Press, a division of Random House, Inc.
squash until the flesh is tender, about 30 minutes. When the squash has cooled enough to handle, scoop out the flesh and set aside. and ginger to the pot and cook until the onion becomes soft, about 4 minutes. Add the pineapple, salt, and white pepper and cook for another 2 minutes. Stir in the chicken stock, heavy cream, and squash and bring to a simmer. Slowly cook the soup, stirring occasionally, for 20 minutes. Remove the soup from the heat and, using an immersion blender, puree the soup until smooth. You can also blend the soup in batches in a blender or food processor. 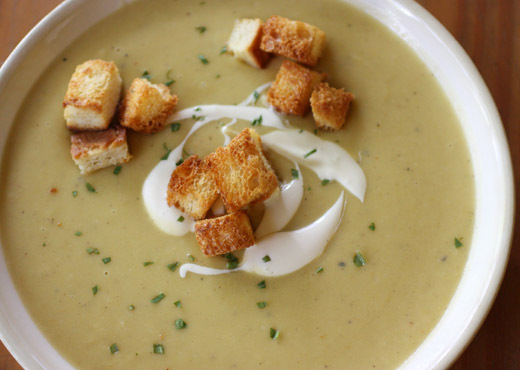 serve, ladle the hot soup into warmed bowls and drizzle the top of each with the sour cream mixture. Garnish with freshly chopped tarragon. You can follow information about Louis Lambert and Big Ranch, Big City on Facebook and Twitter. Two lucky people who comment on this post by Friday, October 28th 2011 at noon CST and who can provide a US mailing address, will be chosen to each receive one copy of the book. Just leave a comment, including your email address so I can contact you, and I’ll randomly pick two winners on Friday. UPDATE: The winners were #7 and #11. Thank you everyone who entered! So, taste is subjective, and it’s also subject to change. Back in the day before I made most of the ice cream we have at home, Kurt and I used to stand in front of the freezer section of the grocery store and negotiate about which flavor to choose. He would quickly rule out my favorite, butter pecan, and I would not even let him point to his favorite which was mint chocolate chip. If I remember correctly, we usually ended up with dutch chocolate or cherry garcia. Each of our favorites had to wait for special occasions like our birthdays or something like that. 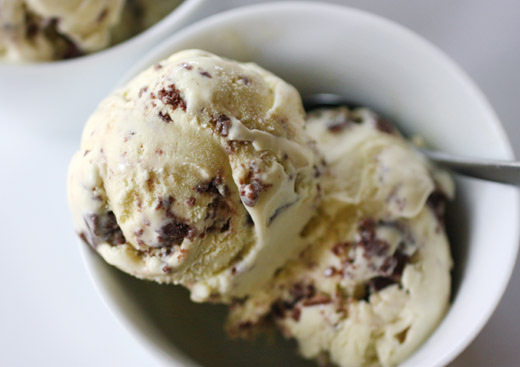 It’s been years since Kurt has even mentioned mint chocolate ice cream, but I thought I’d whip up a special treat just for him and maybe, just maybe, I’d come around to this flavor combination in a homemade version. The fresh mint ice cream recipe is from The Perfect Scoop , and in the perfect pairings paragraph, adding chunks of chewy-dense brownies, also in the book, is suggested. The great thing about the brownies is that they really do remain chewy after being frozen. Little chunks of them were folded into the churned ice cream before letting it set up in the freezer. The ice cream itself was lovely and fragrant from the fresh mint leaves, and steeping the leaves in the milk even tinted it just barely green. 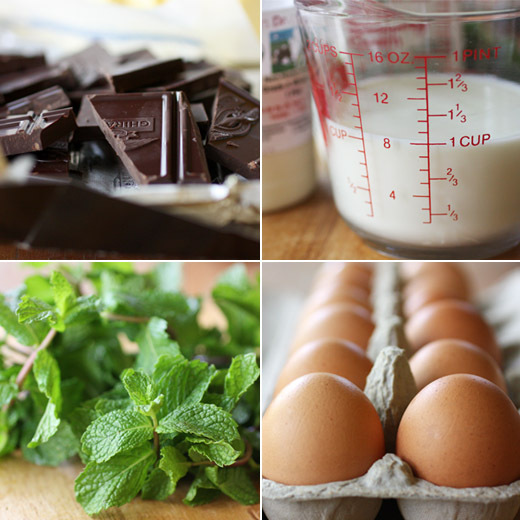 The brownies were made by melting unsweetened chocolate and butter and then adding sugar, eggs, and vanilla. A scant bit of flour along with some salt was added to the batter, and I omitted the chocolate chips and optional nuts. The brownies baked until just set, and then when cool, they were cut into small chunks. To begin the ice cream, milk, sugar, some cream, and a pinch of salt were combined and warmed in a saucepan. Two cups worth of mint leaves were added to the milk mixture, the pan was covered, and it was left to steep for an hour. The mint was strained out of the milk mixture, and the milk mixture went back on the stove to be warmed again. Then, the usual procedure for a custard took place. Five egg yolks were tempered with the warm milk mixture, the whole combination went back on the stove until thick enough to coat the back of a spoon, and then it was strained into a bowl with additional cream. The custard was cooled and then churned in an ice cream maker. 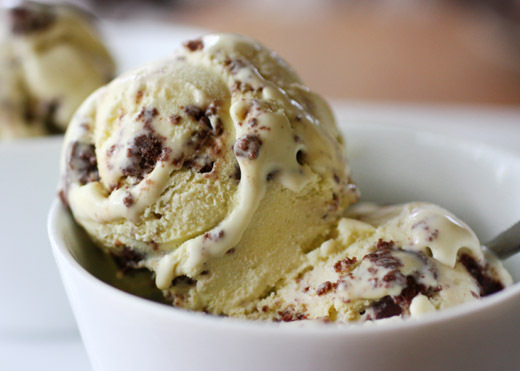 Last, the finished mint ice cream was layered in a dish with chunks of chewy brownies, and it was frozen until firm. Steeping the mint leaves in the milk gave it even more flavor than I expected. The freshness of the mint flavor with the richness of the custard took me by surprise. I liked it. And, those chunks of chewy brownie pieces were way better to my mind than those hard, waxy-tasting chocolate chips in the store-bought stuff that Kurt used to like. Kurt, on the other hand, was confused. This was not the mint chocolate ice cream he remembered from years ago. This was something completely different, and it was very good. But, for the record, he liked those hard bits of chocolate chips. Last month, we visited Chicago for a couple of days just because it had been years since we'd spent time walking around that city in warm weather. The most important thing I learned while there is that visiting the Art Institute of Chicago on the day after Labor Day is a delight. The museum was empty since the long weekend had just ended. Unlike visiting it around the holidays when you'll be squeezing between many thick, winter coat-clad elbows in every attempt to view a major work of art, you'll have space to move about and view the art from different angles. I was thrilled to have Sunday Afternoon on the Island of La Grande Jatte all to myself for several minutes. That was my favorite thing about our Chicago visit. The most important thing Kurt learned during our visit is that you should always go with your first instinct when choosing something from a menu. We had dinner one night at Avec, and he first thought he wanted a flatbread with speck, blue cheese, and arugula, which is a favorite combination of his, but he then changed his mind and went with the pasta. When he saw one flatbread after the next being delivered to other diners, he was green with envy. 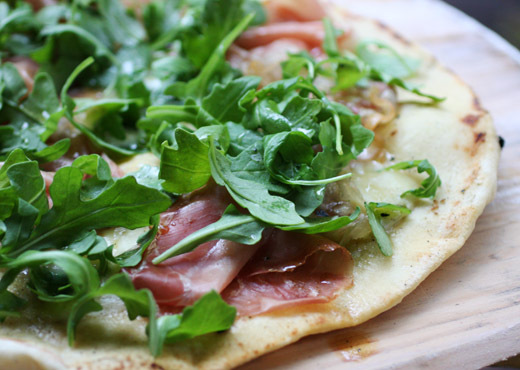 This is why when I decided to make grilled pizzas a couple of weeks ago, one of them had to include speck, blue cheese, and arugula. 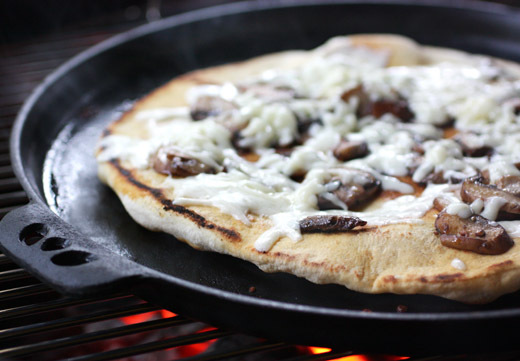 I also made a mushroom version and one with sauteed shishito peppers and fresh mozzarella, and I used my new Camp Chef cast iron pizza pan that was provided by CSGrills.com. There are a couple of tricks to grilling pizza. First, you need to cook both sides of the dough since the intense heat doesn't reach the top side very well. So, the pizza dough is placed on the grill pan, in this case, and cooked for a few minutes, then it's flipped. The second trick is that you need to work quickly so the crust doesn't burn. The cheese should be added to the browned side of the dough first and then the other toppings. By the time all the toppings are in place, the pizza is probably almost done. Therefore, any vegetables that you'd like to have somewhat cooked on the pizza should be cooked before going on as a topping. I sauteed sliced mushrooms and whole shishito peppers before heading to the grill. I also grated, chopped, or sliced all the cheeses I intended to use. Everything should be prepped and in reach. 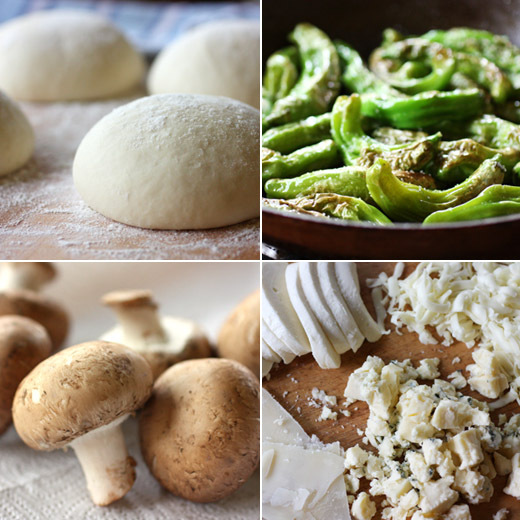 For the mushroom pizza, I used grated quadrello di bufala cheese, for the speck, the cheese was chunks of smokey blue from Rogue Creamery, and the shishito pepper pizza was topped with slices of fresh mozzarella and shards of parmigiano reggiano. The dough for these was made from the recipe in the A16 book which I've made before, and it's easy to make but needs to be started in advance. By starting the dough two days before you plan to use it, and storing it in the refrigerator after mixing and then after folding and turning, it develops great flavor. 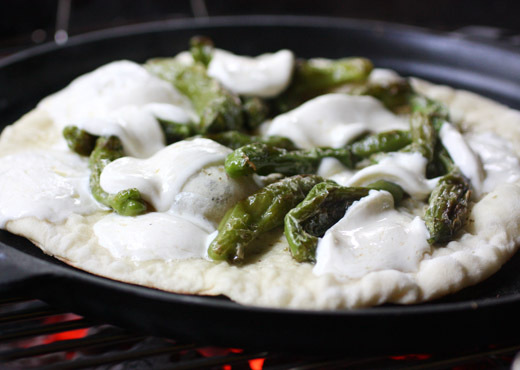 Of course, you can grill pizza directly on the grate, but having the cast iron pan made it a little easier. The dough didn't stick at all to the cast iron, and it was very easy to scoop under the crust with a peel for turning the dough and removing finished pizzas. I always love a mushroom pizza especially when it's drizzled with a little truffle oil as this one was, and Kurt was finally able to forget his menu choice regret. Lisa Fain, What Are You Reading? Lisa Fain, author of the well-loved food blog Homesick Texan started in 2006, has just written her first book The Homesick Texan Cookbook . I have the book in front of me now, open to the Morning Food chapter, and I’m getting distracted. The breakfast relleno, huevos rancheros, Mexican fried potatoes, and pecan coffee cake are making my toast look especially bland this morning. Some of the other chapters are Appetizers, Chilis Soups and Stews, Tex-Mex Classics, Beef Pork and Fowl, Seafood, Sides Hot and Cold, Breads, and Sweets. Just like the blog, the book presents the best of Texan cuisine with beautiful photos. Over the years, the Homesick Texan blog has been lauded repeatedly. It was named as one of the top fifty food blogs by the Times of London, the Best Regional Food Blog by Saveur, and received recognition from the New York Times, Bon Appetit, and Gourmet. Fain is an active member of Foodways Texas and the Southern Foodways Alliance, and is a certified barbecue judge. And, she’ll be visiting Austin soon. This Saturday, at the Texas Book Festival, Fain will be discussing her new book at 12:45 pm in the Capitol Extension Room E2.036. Then, on Monday, October 24, she will be at BookPeople for an Edible Austin book signing event starting at 7:00 pm. I recently asked her, what are you reading? Larry McMurtry has long been one of my favorite writers, but I’d never read his first novel, Horseman, Pass By . It’s a spare yet poetic look at West Texas ranch life and the conflicts between the traditional and the new. There’s lots of arguing in the novel, but one thing that all the characters can agree upon is good food. Many scenes are spent amidst skillets of warm biscuits, bowls of freshly churned peach ice cream, or platters of sizzling, juicy steaks. It’s Texas home cooking at its best, and I was often hungry while reading. The First Texas Cook Book , which was published in 1883, is filled with lots of fascinating recipes that you don’t often see anymore, such as snow pudding, pigshead mash, and pickled brains. Of course, there are lots of old favorites such as biscuits, chow chow and macaroni with cheese. I’m not sure I want to make all of these dishes, but it is interesting to see how our Texan ancestors cooked. Thank you for participating, Lisa. Check back to see who answers the question next time and what other books are recommended. I feel like I’ve been keeping this from you. It wasn’t on purpose of course, but I’ve made these twice before and am only just now getting around to telling you about them. These biscuits are as easy to make as they are delicious, and I highly suggest doubling the recipe which I’ve done each time I’ve made them. 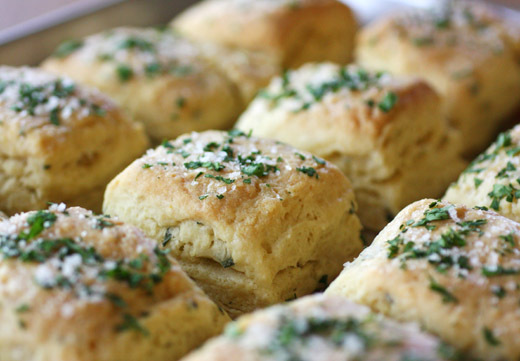 There’s chopped, fresh sage in the biscuit dough, and then when they come out of the oven, they’re brushed with melted butter and sprinkled with chopped parsley. 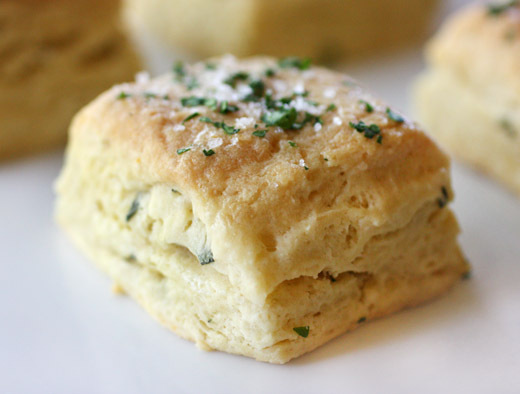 They’re as rich and decadent as buttermilk biscuits should be, and they’re pretty with flecks of herbs inside and out. I found these biscuits in the book Flour by Joanne Chang. The first time I made them, I was looking for something savory to take to the Austin Bakes bake sale earlier this year in April. I was delighted with them, and since they’re quick to prepare, I made them again for the bake sale that just happened a few weeks ago. There’s no cutting butter into flour by hand. The entire process takes place in a mixer. And, once the biscuits are formed, they can be placed in the freezer until you’re ready to bake them. I’m already thinking about how convenient that would be for Thanksgiving dinner. So, you start the dough by placing the flour, baking powder, baking soda, and salt in the bowl of a stand mixer and mix briefly to combine. Then, you add butter that’s been cut into pieces, and mix until the butter breaks down some. 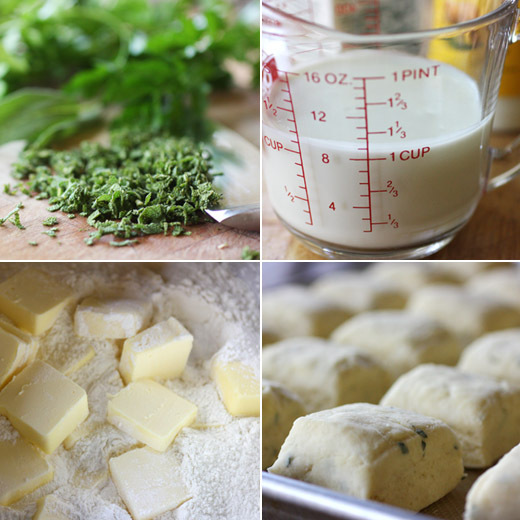 In a small bowl, buttermilk, cream, egg, and chopped sage are whisked together and then added to the mixing bowl, and that is mixed into the flour and butter just until the dough comes together. As you transfer the dough to a work surface, you can work in any loose flour in the bottom of the mixing bowl. After patting the dough into a one-inch thick rectangle, I cut square biscuits to make things easy. Of course, you could use a round cutter, but I like the efficiency of only shaping and cutting once. Since I doubled the recipe and cut smallish squares, I ended up with 20 biscuits. They baked for 40 minutes, and then the tops were bushed with melted butter and sprinkled with chopped parsley. I sprinkled some coarse sea salt on them as well. Like every recipe I’ve tried from this book, it works beautifully. My only disappointment with these biscuits is that each time I've baked them, I only kept a couple of them at home. I was happy to take them to the bake sales, but next time, I’m making a batch just for us. There are several perfectly fine, simple things to do with green beans like just steaming them and maybe topping them with sliced almonds or boiling them and tossing them with roasted potatoes. However, when some green beans appeared in my CSA box a couple of weeks ago, I really wanted to give them some zippy flavor. I wanted to use them in a Thai-style curry or maybe in some kind of interesting salad. I found exactly what I had in mind in, of all places, an Italian cookbook. 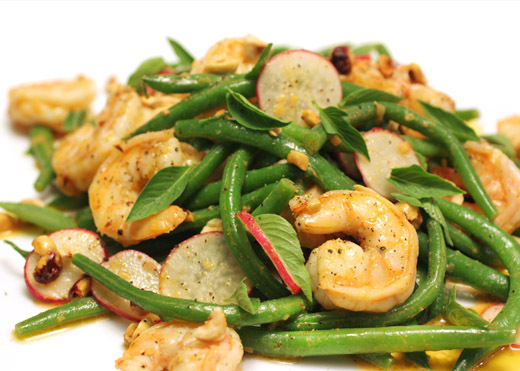 Stir , by Barbara Lynch, had become a favorite source of mine for interesting pasta, pizzas, soups, and salads, and that’s where I found this green bean and shrimp salad. The big flavor I was looking for is in the vinaigrette which is made with shallots, white wine vinegar, Thai red curry paste, and creme fraiche. 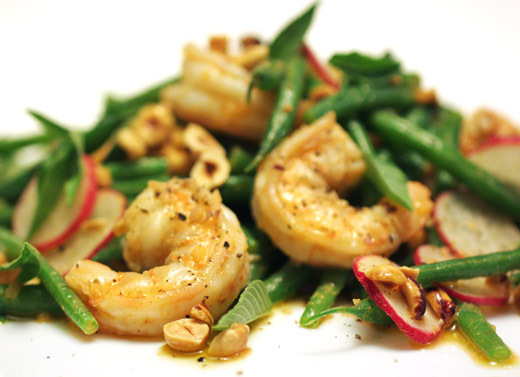 The salad itself is composed of blanched, crisp-tender green beans, big, seared shrimp, thin slices of radishes, and toasted hazelnuts. With so many textures and flavors coming together, this salad was exactly the kind of thing I imagined for those green beans. The vinaigrette can be made in advance, and I should have made extra to use on a lettuce salad the next day. In a small bowl, finely chopped shallots, white wine vinegar, and Thai red curry paste were combined. Grapeseed oil, creme fraiche, and lemon juice were whisked into that mixture. It was seasoned to taste with salt, and of course, more curry paste can be added to make it spicier. Radishes were thinly sliced, and I used a benriner to make very thin slices. I also placed the radish slices in a bowl of ice water while prepping everything else to make them extra crisp. Next, hazelnuts were toasted in the oven and then rubbed in a towel to mostly remove the skins. The green beans were blanched to preserve their color, and the shrimp were seared in a saute pan until just cooked for about a couple of minutes per side. 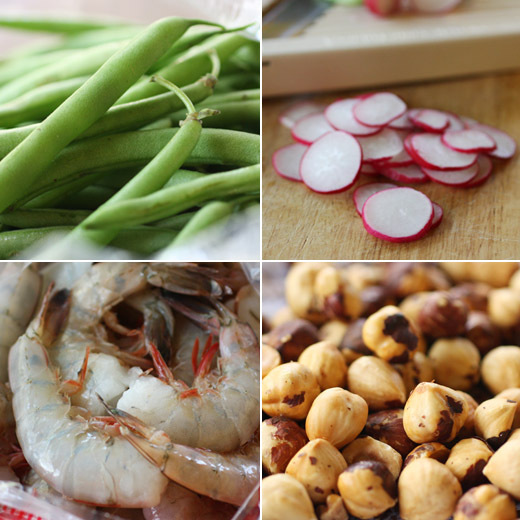 The green beans, shrimp, radishes, and hazelnuts were combined in a large bowl and tossed with the vinaigrette. I garnished the salad with Thai basil leaves, but cilantro was suggested in the recipe. Of course, this salad could easily be adapted to include more of one thing and less of another. In the headnote, Lynch writes that she sometimes leaves out the shrimp when taking the salad to a picnic or serving it as a side dish. However the salad is composed, the vinaigrette is the one thing that shouldn’t change. The creamy texture and bright, lively flavors made this salad what it was. A first flip through a cookbook always ends with those several pages that get marked because of great-looking things that I intend to make right away. Then, reality happens, and I might not get back to those marked pages for weeks or maybe months. These cookies were on one of those marked pages in Chewy Gooey Crispy Crunchy Melt-in-Your-Mouth Cookies by Alice Medrich. I’ve baked a few other things from the book, but I only recently made my way back to this page. I was looking for a birthday cookie for my sister, and I remembered these fruit-filled squares. This is the first cookie of the Chewy category, but they’re a little bit crispy too. It’s an interesting cookie technique and one I hadn’t tried before. Basically, they’re made from two layers of pastry with dried fruit in the middle and a coarse sugar topping. As they bake, the top layer of pastry settles around the bits of fruit and makes a pebbly-looking surface. Once cool, they’re crisp and firm enough to pack and ship without fear of them crumbling. Another great thing about these cookies is the possibility of infinite flavor variations. I went with lemon zest in the dough and a filling of dried cranberries, but other suggestions include cinnamon or anise in the dough and dried fruit like golden or dark raisins, apricots, dates, cherries, candied ginger, or any combination of those. Starting the dough is the standard cookie procedure of creaming butter and sugar and adding an egg and vanilla. Next, you add the flavor component of choice which was lemon zest for me, but it’s noted in the recipe that anise smells lovely in the dough as it bakes. Then, the dry ingredients of flour, baking powder, and salt were added and mixed to combine. The dough was divided in half, each half was pressed into a round, and the rounds were wrapped in plastic and chilled for a few hours. Once chilled, one piece of dough at a time was rolled in between sheets of parchment paper into a big rectangle. The dough does become a little sticky as it comes up in temperature, so the parchment makes it much easier to roll without excess flour. 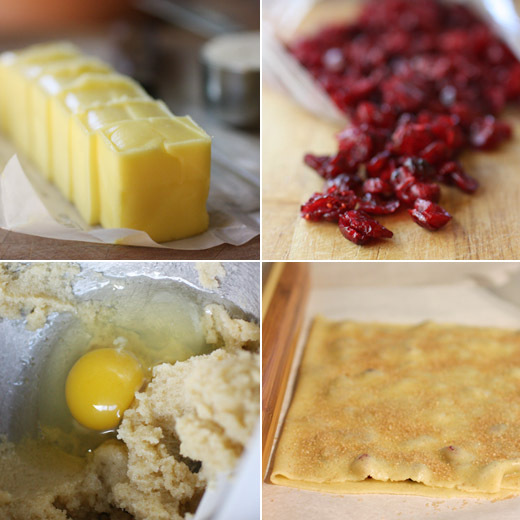 To fill, the top piece of parchment was removed, dried cranberries were strewn about on the bottom half of the rectangle of dough, and the top half of dough was folded over the bottom. The top was then sprinkled with turbinado sugar, the edges were trimmed, and squares were cut. The process was repeated with the second piece of dough, and the squares baked for about 15 minutes. For a brief moment, it seemed like rolling the dough and folding and cutting was going to be complicated, but it was actually pretty simple. The squares were cut and ready to bake in no time. I’m already thinking about flavors to try next time. It might be cinnamon in the dough and dried apricots and candied ginger for the filling. 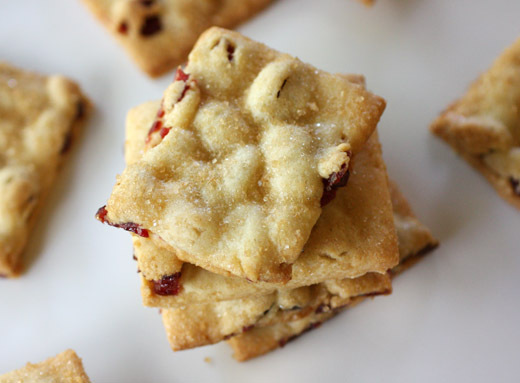 With crunchy pastry layers and a chewy fruit filling, these are worth trying in every flavor combination you can imagine. There was a time when one of my favorite things to "make" for dinner was a phone call to our local Chinese restaurant for take-out. These days, I'd rather make my favorite take-out choices from scratch. I even took it one step further this time by making a homemade chile garlic sauce. I read labels like a hawk to check for ingredients I'd rather avoid, and one tip-off about a product is whether or not it's on the shelves at Whole Foods. A chile garlic sauce I've used in the past is no longer sold at Whole Foods, and that's because of a preservative it contains. So, I decided to make my own. You can do whatever you want with homemade take-out. You can also decide if you want to use dark meat or white meat chicken, and Kurt prefers white meat, so that's what I used. And, another important issue is that when you make it yourself you can make it as spicy as you'd like, and that tends to be extra spicy for us. 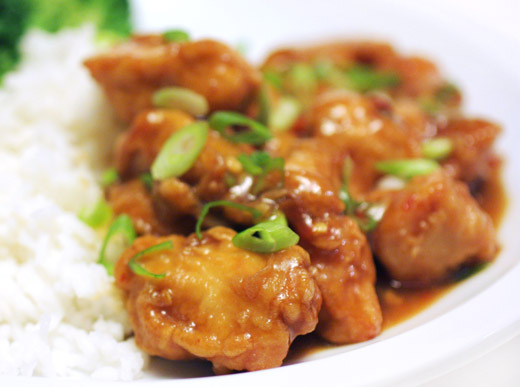 With all these considerations, our General Tso's chicken was tailor-made to suit our tastes. The original recipe came from the May issue of Food and Wine, and the crispy chicken and sweet-spicy sauce were quick and easy to prepare. To make the chile garlic sauce, you can use fresh red chiles or dried. I used dried because I had several stored away with my spices. I chopped them in a food processor with garlic, salt, sugar, and rice vinegar. Just add a little vinegar as you begin to puree, and then add more as needed for the paste consistency you want. The paste can be stored in the refrigerator for a few months, or you can just make what you need and not have one more thing cluttering the refrigerator which is what I should have done given the state of my refrigerator. 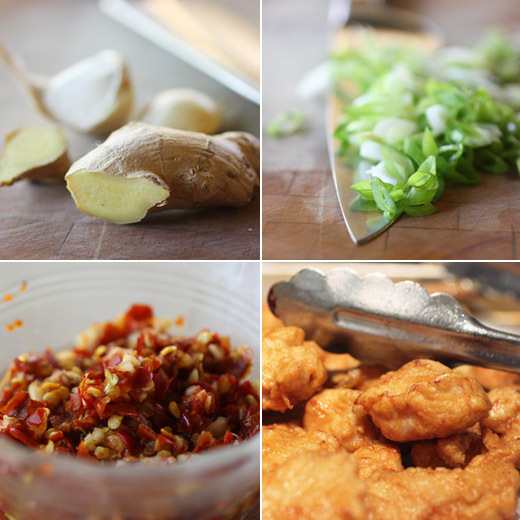 To start the General Tso's chicken, sesame oil, an egg white, soy sauce, and cornstarch were combined. Chunks of boneless chicken were added to the mixture, turned to coat, and were left for 20 minutes. In a separate bowl, chicken broth, chile garlic sauce, sugar, soy sauce, and cornstarch were whisked together for the sauce. In a sauce pan, minced ginger and garlic were cooked in oil for a minute, and the sauce mixture was added. This was cooked while stirring until slightly thickened and then kept warm while the chicken was fried. The coated pieces of chicken were pan fried for a couple of minutes per side and then drained on a paper towel-lined sheet pan. Last, the chicken was added to the sauce and stirred to cover before being served with rice and broccoli. This meal really was a breeze to make, and next time, I'll already have my homemade chile garlic sauce ready to use assuming I can find it in my packed refrigerator. 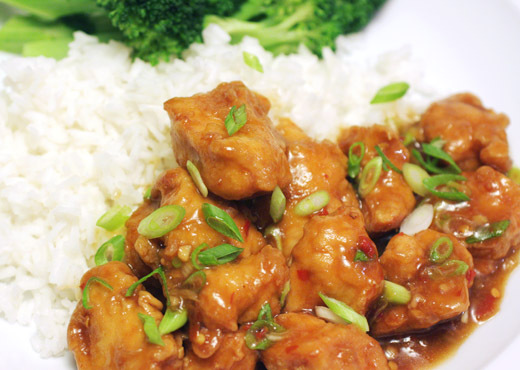 We no longer live near that Chinese restaurant, so our old, favorite take-out isn't an option anymore, but with recipes like this, that's ok.